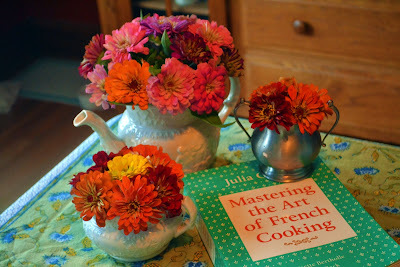 Yesterday we hosted our annual birthday celebration for Julia Child. She would have turned 99 this year and I am delighted her recipes are able to live on in our house in such a grand fashion. Many of our best foodie friends eagerly tackled some challenging dishes from Mastering the Art of French Cooking and brought the resultsof their efforts to share with the party crowd. Briased cucumbers proved to be the only failure of the night and all of the remaining dishes were astonishingly good this year! Sue could have made twenty loaves of bread and every last crumb would have been devoured! Everyone concurred she was the best dressed of the evening! No question about it! Kids are always welcome at Julia's birthday! I love seeing all of the young plates perk up when they get a taste of one of Julia's big braised meat dishes in the middle of summer! Every party guest learned that a chocolate souffle always tastes better when mixed, baked and served in the middle of the night by a very pregnant woman and her husband who hatched the plan to make dessert on site! Vik and Kaberi...you win the 2011 Julia Child award for Mastering the Art of French Cooking and serving the best dish of the night! Before we knew it the deck was glowing and our bellies were full. This is one of my favorite parties of the year! I can't imagine what we'll plan next year for what would have been Julia's 100th birthday. the best time ever! can't wait for the 100th ... maybe we'll try our hand at a savory souffle!